Joe Borges presents the Society’s check to the Herald News editor. 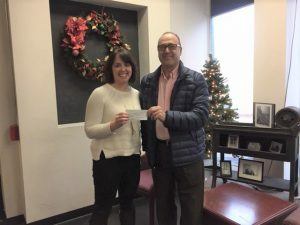 As the colder months approach, those in need will be able to find a hot meal, in part thanks to the generosity of those who contributed to the Prince Henry Society of Fall River annual holiday food drive. The event provided funds and food to pantries and soup kitchens in the Greater Fall River area. And the community responded. This year, Prince Henry Society members collected a total of $2,610 –an increase of $810 from 2017 food drive. In addition, the group collected a total weight of 2095 pounds of food which was 1125 pounds more than last year. 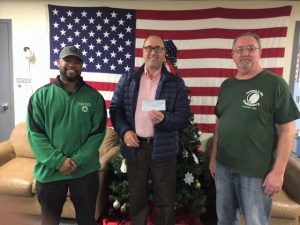 “We challenged ourselves to improve over last year’s collection of food/donations and we did it with the help of the community,” Joe Borges said. He chairs the Society’s Humanitarian and Relief Committee with Michelle Orlando. The event is also sponsored by Radio Voz do Emigrante and was held at Portugalia Market Place and Seabra Supermarket in Fall River. Borges stressed the support of Frank Baptista at RVDE and the owners of the two markets was outstanding and appreciated. Donations of $350 were made to St Michael’s Soup Kitchen, St Bernadette’s Soup Kitchen, Holy Trinity’s Soup Kitchen, St Anne’s Food Pantry, the Veterans Association, and the Herald News Holiday Fund. The balance will be used by the committee as needs arise in 2019. Although the food drive is over, the Society continues to accept tax deductible donations via mail on the group’s website (http://www.phsfr.org). Joe Borges makes the food drive donation to the Veterans Association.